Over the last couple of years, Kino Lorber have been resolutely releasing all of Fritz Lang’s early silent films on DVD and then Blu-ray, adding some important titles to the home video market. 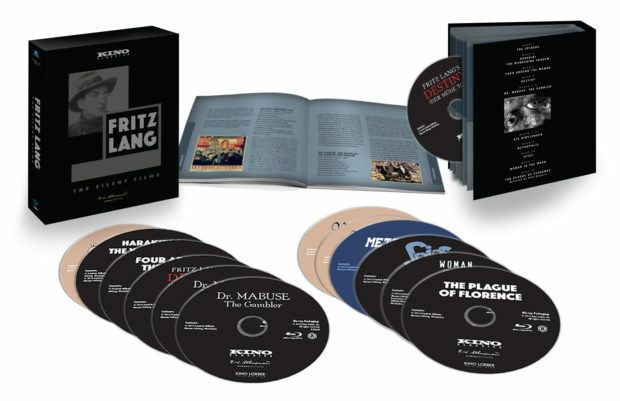 But their latest Lang offering—a 12-disc Blu-ray box set, Fritz Lang: The Silent Films—is one of the essential releases of the year and thus far is the reigning champion in terms of Lang on Blu-ray. There has definitely been some competition; Masters of Cinema are simultaneously releasing a special features-heavy Metropolis with several versions of the film, and their catalogue includes a number of other early Lang titles, while Arrow have also recently released the highly underrated Secret Beyond the Door in their Four Film Noir Classics box set. And though Criterion has semi-recently put out an excellent edition of M on Blu-ray, their lack of attention to Lang is, frankly, embarrassing. 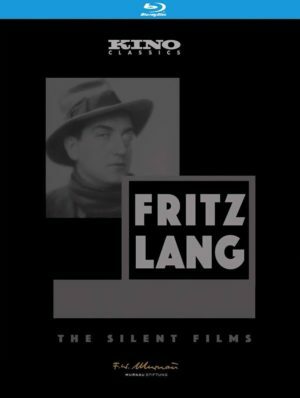 Admittedly, I’m a little obsessed with complete collections and well-organized box sets; I’m also a Lang fanatic and am currently writing a monograph on M, so it wouldn’t be a stretch to say that I’m the target audience for Fritz Lang: The Silent Films. Aside from his first two films, Halbblut (1919) and Der Herr der Liebe (1919), which are believed to be lost, the set gathers all of his silent films, which is no mean feat. It includes Die Spinnen (The Spiders, 1919-1920), Harakiri (1919), Das wandernde Bild (The Wandering Shadow, 1920), Vier um die Frau (Four Around the Woman, 1921), Der müde Tod (Destiny, 1921), Dr. Mabuse, der Spieler (Dr. Mabuse, the Gambler, 1922), Die Nibelungen (1924-1925), Metropolis (1927), Spione (Spies, 1928), Frau im Mond (Woman in the Moon, 1929), and, as a wonderful extra, Pest in Florenz (The Plague of Florence, 1919), an Edgar Allan Poe adaptation with a script from Lang. On one hand, I’m not a great person to review this set, because I won’t be able to do so with any real objectivity. I am unabashedly just here to celebrate one of my favorite directors, and even when I can acknowledge that some of his films are flawed or problematic, I have a probably absurd devotion to all of them—even Man Hunt. So in short, I love this set and I think many of these titles are critical viewing for anyone who considers themselves to be a serious fan of cinema. The set is a triple threat, in that this particular collection of films provides an indispensable introduction to: silent film, Weimar cinema, and the early career of one of the most important figures in cinema history. How can you argue with that? And even if you’re someone not typically drawn towards silent films, or you only know Lang from Metropolis or M, these films are packed with passion and innovation. They span a wide range of genres, including romance, crime films, and adventure serials; in other words, something for everyone. They represent a sometimes paranoid, nihilistic worldview, but one tinged with wonder, and even hope. In watching these films, there’s also the sense that cinema as a changing medium is developing before your eyes. Particularly because Lang was an innovator of the silent film serial, ever present in the ‘10s, ‘20s, and ‘30s but largely replaced today by television and recurring film series/franchises. For example, it’s easy to draw a line between The Spiders, Lang’s two-part adventure serial from 1919 and 1920, and the Indiana Jones films. Many of the fantasy-adventure films of the late ‘70s and ‘80s (including Star Wars) that continue on, however feebly, into the 2010s borrow directly from the tropes established by crime and adventure serial auteurs like French director Louis Feuillade and Lang himself. The Spiders, divided up into The Golden Sea and The Diamond Ship on the first disc of the set and meant to continue on in two other unrealized segments, follows the standard trope of a white male adventurer thrust into a number of death-defying situations in exotic locales. Kay Hoog (Carl de Vogt) finds a message in a bottle from a lost Harvard professor that includes a treasure map allegedly leading to unimaginable Incan wealth. Hoog sets out on the trail, unaware that a criminal gang known as the Spiders are following his footsteps, particularly the deadly Lio Sha (Ressel Orla). Hoog finds the Inca and falls in love with a beloved priestess (star Lil Dagover, a later favorite of Hitler’s), though their romance is nearly stunted by human sacrifice. Ultimately they escape, but a jealous Lio Sha kills the priestess after Hoog scorns Lio Sha’s love. The Diamond Ship is a much darker revenge tale, as both Hoog and the Spiders set out to claim an invaluable diamond shaped like the head of Buddha, and Hoog seeks to avenge the death of the priestess. This second half descends into an absolute maelstrom of adventure tropes, many of which would repeat themselves in the Fu Manchu novels and films: it is revealed that the diamond holds the fate of Asia in its sway and there’s a princess (whose character is named Ellen Terry! ), an evil hypnotist, a secret underground Chinatown below San Francisco, pirates, and a cave full of criminals are conveniently wiped out by poisonous fumes from a volcano. And did I mention that the Spiders leave behind preserved tarantulas with each victim as their calling card? Film serials are admittedly not for the faint of heart; these two episodes alone total nearly three hours, though anyone who routinely marathons television series on Netflix will be well prepared for the time commitment. And with all the wonderfully pulpy action, dastardly deeds, cliffhangers, and rapidly changing exotic locales, the running time flies by. I really wish Lang had gotten to make the next two planned films, To Asia’s Imperial Crown and In the Spider’s Web. Anyone who has mistakenly interpreted him as some sort of inaccessible, highbrow art film director would do well to seek out The Spiders. From Incan sacrifice to English pirates, Chinese gangsters, and black-clad robbers, the almost ridiculous amount of action results in some surreal moments. There is also some inspired special effects and stunt work, such as a quick escape on a hot air balloon, which feels surprisingly fresh and this is certainly a film that exploits the beauty of its many set pieces. It’s easy to forget you’re watching a relatively stagey silent film during a lot of the awe-inspiring temple scenes of The Golden Sea. The Diamond Ship also includes a number of technical innovations, thanks to the appearance of the great Karl Freund as cinematographer; fortunately he would go on to collaborate with Lang again. This certainly isn’t just a disposal adventure serial. 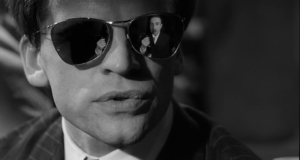 It looks forward to Spies and Dr. Mabuse, the Gambler even if it isn’t quite on their level and introduces some of Lang’s trademark themes: criminal conspiracies, paranoia, corruption, and surveillance. Written by Lang himself, it subtly subverts some of the fantasy/adventure tropes from within. For example, there is something somber, even a bit grim about Hoog and he has far more in common with the moodiness of Bruce Wayne than the plucky determination of Indiana Jones. Like a lot of Lang’s later films, romance is not the centerpiece of this film, but something of an afterthought, while the female characters—at least Lio Sha—manage to be more substantial than Hollywood interpretations of similar material. As the leader of the Spiders, Lio Sha is violent and ruthless. This sense of female agency can’t even be attributed to Thea von Harbou, soon to be Lang’s wife and regular scriptwriter, as Lang wrote the film himself. Like many of the films in this set, The Spiders was believed to be lost until a print was found in the ‘70s, when Lang oversaw some of the restoration. It looks wonderful on Blu-ray and is less damaged than might be expected. There’s a score provided by composer Ben Model, which, fortunately or unfortunately, reminded me a lot of the music for some of the Final Fantasy video games. Nothing against Model or Kino, but many of these recently composed silent film scores are often not to my personal taste, and have such relentlessly busy music that it seems like the composers are hoping to be paid per note. This aside, my complaints with this particular disc are very few: there are no special features and a short featurette or even a commentary track could have provided some necessary insight for viewers unfamiliar with the history of crime/adventure serials. I also wish there were German intertitles available (English is the only option), but this is a very minor complaint that extends throughout the set. In between shooting the two segments of The Spiders, Lang made a film that is seemingly quite different: Harakiri, which is based on the same story that inspired Puccini’s Madame Butterfly less than two decades prior. Harakiri has been notoriously difficult to see—it’s another film that was believed to be lost until a Dutch print was discovered in the late ‘80s—and has been written about critically very little. General consensus seems to be that this doesn’t feel like a particularly Langian film, but I disagree, as it still plays with a number of Lang’s recurring themes. 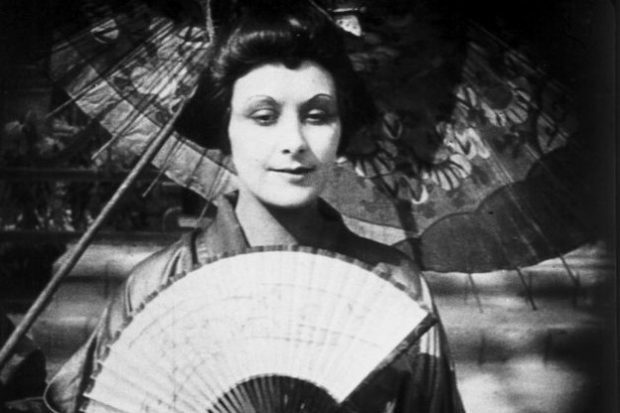 A beautiful young woman, O-Take-San (Lil Dagover again), is the object of the obsessive attentions of a powerful Buddhist priest (another Lang regular, Georg John). He wants her to become ordained as a priestess so that she will fall completely under his power. Her open-minded father (prolific actor Paul Binsfeld), a diplomat who regularly travels to Europe, doesn’t force this on her and, in revenge, the priest manipulates events so that O-Take-San’s father is named a traitor and is forced to kill himself to maintain his honor. Things go from bad to worse for O-Take-San, who is held prisoner at the temple. She escapes, but is forced to become a geisha, which is where she meets Olaf (Niels Prien), a naval officer who falls in love with her. He agrees to marry her for 999 days, as is the local custom, and she returns his love. But he abandons her a few months later when he is called home, though she is pregnant and gives birth to his child. Later, when the four years of their marriage have passed and she is theoretically free from obligation, the malicious priest intervenes in her life yet again. With a title like Harakiri, it’s reasonable to assume that a film that begins with a suicide would end with one as well. The film is tragic, while also being deeply cynical, and O-Take-San stands as one of Lang’s many alienated protagonists. She has been made an outcast because the priest is obsessed with possessing her, but also because of her own obsession with Olaf. Despite the fact that he abandons her for years, she refuses to accept a marriage proposal from a kindly prince (Meinhart Maur), whether out of love for Olaf or a sense of duty towards him. She is crushed under this sense of doomed fate that afflicts many of Lang’s characters and suicide is certainly a recurring theme in his work. 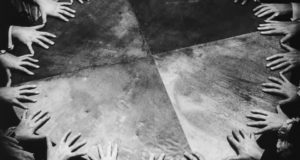 Suicide, in his films, is often a way to escape guilt, but even more so, persecution, which Lang would explore more in other silent films like Spies and Dr. Mabuse, the Gambler. It was also soon to have an ominous presence in Lang’s own life: his first wife, Lisa Rosenthal, died of an alleged suicide a year later, by shooting herself with Lang’s revolver. Suspicion was also cast on Lang; a theme that he dealt with intimately two decades later in Ministry of Fear, though he apparently tried to suppress this detail of his personal life. One of the characters tells a deeply in love O-Take-San, “Don’t believe in your happiness so strongly—things can change quickly.” This is the overall thesis of the film. Though Harakiri is clearly sympathetic to the fact that O-Take-San is rigidly controlled and callously manipulated by the men around her, she is both unable and unwilling to escape this sense of corruption and abuse of power that exists through all levels of her society. Even Olaf reminds her that the three virtues of Japanese girls are that “they must hear nothing, see nothing, and say nothing.” This sense of moral duty and social responsibility was definitely a component of The Spiders through the character of the Incan priestess, and Lang would go on to explore its mythic, even pagan connotations in Die Nibelungen. An early Western film to explore Japanese culture, Harakiri, typically for the period, has some Asian extras but Europeans are cast as all the leads. One way it doesn’t feel like a Lang production is that there is a more subtle sense of visual style overflowing with silk costumes, butterflies, fans, and flowers. There are relatively fixed sets that mostly stick to Japanese gardens, a teahouse, and the Buddhist temple. While the film is absolutely gorgeous—despite the print being in noticeably rougher shape than The Spiders—this fetishization of Japanese culture is admittedly distracting. Overall this is a Lang title that will probably only interest fans of the director or, alternately, anyone with a love for Madame Butterfly who wants to see a slightly different take on the material. Like The Spiders, this disc unfortunately has no extras, though the violin-focused score from Aljoscha Zimmermann is still a bit busy, while also being appropriately restrained at times. But, unlike the more straightforward tragic melodrama of Harakiri, there is something fantastical, even mystical about The Wandering Shadow. To escape her pursuer (Hans Marr)—her dead husband’s family member, who is determined to take part of her inheritance—she flees into the Alps, where the film was also shot, abandoning Lang’s heavily designed studio sets for a change. About a third of The Wandering Shadow is missing, which contributes to its eerie, even surreal tone. This is yet another one of Lang’s silent films that was believed to be missing until the ‘80s, when it was reconstructed. Perhaps because of this the film doesn’t follow a particularly linear progression and includes a number of flashbacks to explain the current state of events. Apparently no original intertitles survived, but there is some added text and dialogue for clarity. Curiously, The Wandering Shadow is one of Lang’s few films that could be described as a mountain film (or Bergfilme), an enormously popular genre in German cinema at that time. Leni Riefenstahl built her career up around Bergfilme, though the most famous example is probably G.W. Pabst’s later The White Hell of Pitz Palu (1929). While man against the elements is often a general theme in this genre, The Wandering Shadow takes on a particularly spiritual bent, where a woman attempts to solve her existential, moral, and romantic crisis while fleeing into the depths of the mountain wilderness. 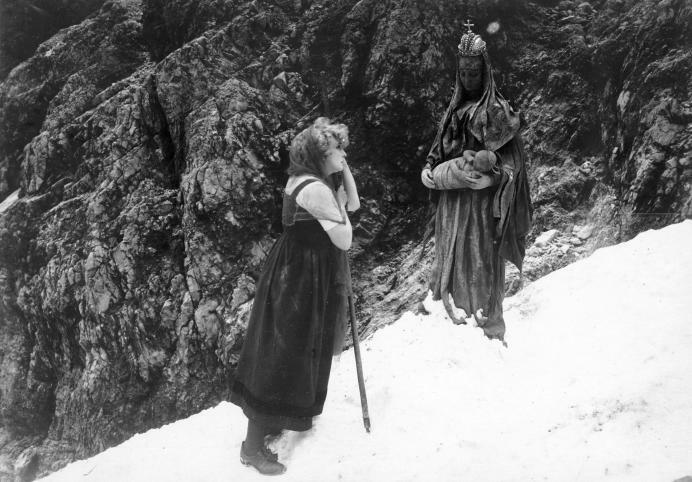 She is assisted by a cantankerous hermit and the titular “wandering image” (the actual translation of the German title) is a stone statue of the Virgin Mary that looms over the proceedings. Notably, this was also Lang’s first collaboration with Thea von Harbou, who wrote or co-wrote many of his early films (they wrote The Wandering Image together). It marks an interesting change in tone—no doubt influenced by von Harbou, who was neither a subtle nor secondary contributor to her husband’s work—and is obviously an important point of development, serving as sort of a bridge between Harakiri and Destiny, his masterpiece of mysticism, fantasy, and moral melodrama that would come just a few years later. It’s interesting to think that they likely fell in love over a film that explores how marriage can be a constricting and unnatural artifice. Speaking of collaborations, the film was produced by Joe May, whose wife Mia stars in the film. May was another German cinema pioneer and, like Lang, made his early career with fantasy adventure films and serials. He worked with Lang and von Harbou soon after The Wandering Image on The Indian Tomb (1921), which the couple wrote together and May directed. Lang would go on to remake this film in the final years of his career, when he finally returned to Germany. The Wandering Image is maybe one of the more curious, under-explored titles in Lang’s cinematography, but it’s one that I genuinely love, largely because of its strange and mystical qualities. Despite the truncated running time, it’s impossible not to connect with the heroine, who is a particularly resilient example of Lang’s ostracized, lonely protagonists. Unfortunately the disc contains no extras, though there is another nice score from Aljoscha Zimmermann. This is followed by yet another complicated exploration of melodrama and marriage with Four Around the Woman, also known as Hearts in Struggle, though its elements of paranoia, conspiracy, and surveillance make it an obvious precursor to Dr. Mabuse, the Gambler and Spies. Rudolf Klein-Rogge, Dr. Mabuse himself, would appear in the film, and disguises, ruses, and lies all play an important part in the narrative, even more so than The Wandering Shadow’s use of deception as a means to an ultimately positive end. The film essentially focuses on a man (Ludwig Hartau) determined to uncover if his wife (Carola Toelle) has been cheating on him. Four Around the Woman definitely has Lang’s trademark visual style, which feels at its most confident so far here, and there are a number of innovative shots as he immerses the audience in a world of upper class corruption and vice. 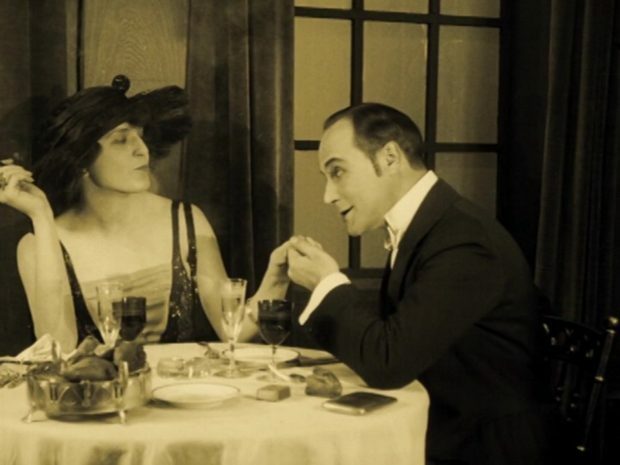 Like The Wandering Shadow, flashback is used as the story unfolds, as well as two male characters pursuing the same woman who are played by one actor (Anton Edthofer in this case, Hans Marr in The Wandering Shadow). The frequently nonsensical, overly complicated plot elements give way to an unexpected sense of surrealism and there is even something Gothic at the core of Four Around the Woman. As in much Gothic literature, love is often not a positive force in Lang’s films, but a source of suffering and misery; passion leads to obsession and often to madness or violence. Von Harbou contributed to this script as well, though ultimately this film seems like an exercise or a game, a way for Lang (and, by association, von Harbou) to prepare for the logical and stylistic leaps required to make Dr. Mabuse, the Gambler. That film has a similarly dizzying array of characters made more confusing by the fact that disguises are endless and motivations are murky at best. The core of that is here in Four Around the Woman, which also flirts with criminal conspiracy: a number of characters seem to be jewel thieves or at least fence stolen jewelry. Blackmail is a major plot element. Despite the fact that it is one of the least discussed—or seen—of Lang’s films, Four Around a Woman is a point where he unmistakably immerses himself, his characters, and the audience in the grimy underworld, the urban hell, that would become such a trademark in his films. Even just as an exercise, it’s an enjoyable and important development in his career. As with the other early silent films discussed, Four Around the Woman has no special features included, though it’s worth mentioning that because of the restoration process, this film has intertitles in German with an English subtitle option. The print is noticeably more damaged than some of the others, though it’s still a gorgeous film. In the next part of this essay, I’ll examine more of the films in the set: the moralistic fantasy Destiny, Lang’s classic and visionary crime serial Dr. Mabuse, the Gambler, and his mythological epic, Die Nibelungen.